(17) Shao, Y. et al. Advances in Molecular Quantum Chemistry Contained in the Q-Chem 4 Program Package. Molecular Physics (2014). DOI: 10.1080/00268976.2014.952696. (14) J. A. Parkhill, Alán Aspuru-Guzik. A correlated-polaron electronic propagator: open electronic dynamics beyond the Born-Oppenheimer approximation. J. Chem. Phys. 137, 22A547 2012. (13) John A. Parkhill, David G. Tempel, & Alán Aspuru-Guzik. Exciton coherence lifetimes from electronic structure. The Journal of Chemical Physics, 136(10):104510, 2012. (12) R. L. Aggarwal, L.W. Farrar, J. Parkhill, A. Aspuru-Guzik, and D. L. Polla. Measurement of the third order non-linear optical susceptibility x(3) for the 1002 mode of benzenethiol using coherent anti-stokes Raman scattering with continuous-wave diode lasers. Journal of Raman Spectroscopy, 43(7):911–916, 2012. (11) John A. Parkhill, Dmitrij Rappoport, & Alán Aspuru-Guzik. Modeling coherent anti-stokes raman scattering with time-dependent density functional theory: Vacuum and surface enhancement. The Journal of Physical Chemistry Letters, 2(15):1849–1854, 2011. (9) Narbe Mardirossian, John A. Parkhill, & Martin Head-Gordon. Benchmark results for empirical post-gga functionals: Difficult exchange problems and independent tests. Phys. Chem. Chem. Phys., 13(43):19325–19337, 2011. (8) John A. Parkhill, Martin Head-Gordon. A tractable and accurate electronic structure method for static correlations: The perfect hextuples model. The Journal of Chemical Physics, 133(2):024103, 2010. (7) John A Parkhill, Martin Head-Gordon. A sparse framework for the derivation and implementation of fermion algebra. Molecular Physics, 108(3):513, 2010. (6) John A. Parkhill and Martin Head-Gordon. A truncation hierarchy of coupled cluster models of strongly correlated systems based on perfect-pairing references: The singles + doubles models. The Journal of Chemical Physics, 133(12):124102, 2010. (5) John A. Parkhill, Keith Lawler, & Martin Head-Gordon. The perfect quadruples model for electron correlation in a valence active space. The Journal of Chemical Physics, 130(8):084101, 2009. (4) John A. Parkhill, Jeng-Da Chai, & Martin Head-Gordon. The exchange energy of a uniform electron gas experiencing a new, flexible range separation. Chemical Physics Letters, 478:283–286, 2009. (3) Keith V. Lawler, John A. Parkhill, & Martin Head-Gordon. The numerical condition of electron correlation theories when only active pairs of electrons are spin-unrestricted. The Journal of Chemical Physics, 130(18):184113, 2009. (2) Andrew L. Mattioda, Lindsay Rutter, John Parkhill, Martin Head-Gordon, Timothy J. Lee, & Louis J. Allamandola. Near-infrared spectroscopy of nitrogenated polycyclic aromatic hydrocarbon cations from 0.7 to 2.5 μm. Ļe Astrophysical Journal, 680(2):1243–1255, 2008. (1) Keith V. Lawler, John A. Parkhill, & Martin Head-Gordon. Penalty functions for combining coupled-cluster and perturbation amplitudes in local correlation methods with optimized orbitals. Molecular Physics, 106(19):2309–2324, 2008. (4) Kun Yao & John Parkhill. 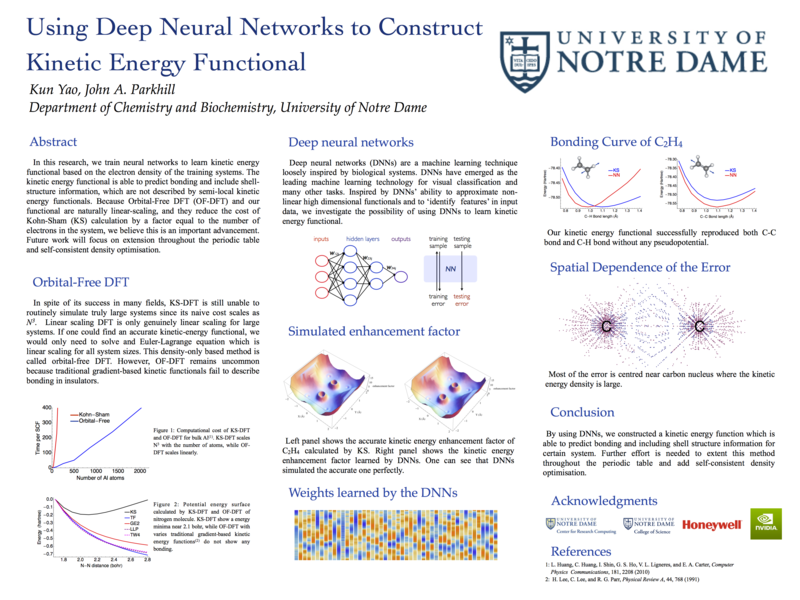 Using Deep Neural Networks to Construct Kinetic Energy Functional. 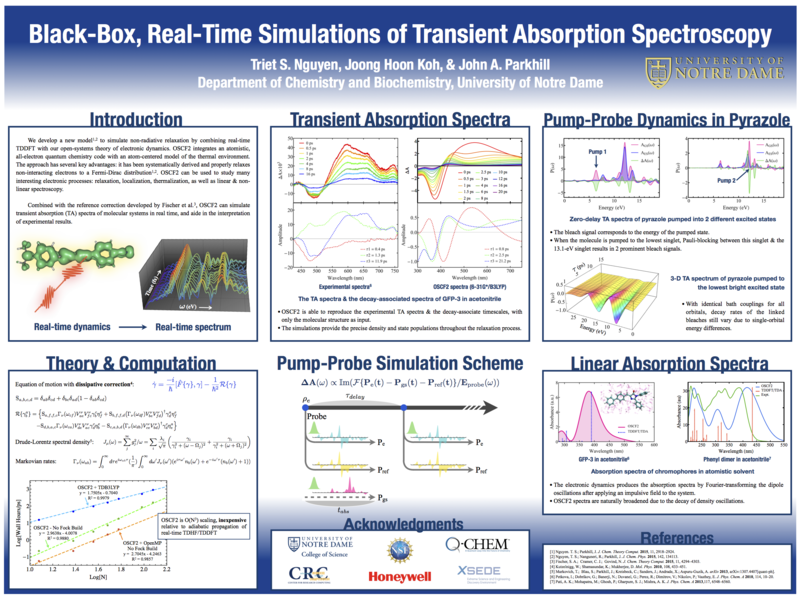 The 15th International Conference of Quantum Chemistry – Beijing, China (2015) and Midwest Theoretical Chemistry Conference – Ann Arbor, MI (2015). (3) Triet S. Nguyen & John Parkhill. Real-time Electronic Dynamics OSCF2. 249th ACS National Meeting – Denver, CO (2015). (2) Triet S. Nguyen & John Parkhill. Non-radiative Dynamics From Electronic Structure. The American Conference on Theoretical Chemistry – Telluride, CO (2014). (1) Triet S. Nguyen & John Parkhill. Constructing More Realistic Molecular Bath Models. 246th ACS National Meeting – Indianapolis, IN (2013) (1 month after arriving at ND).